The old Sadisverlag folded Imperium Romanum posters are almost sold out, so the time had come to think about a better replacement. Instead of just reprinting the old posters I decided to make something else. 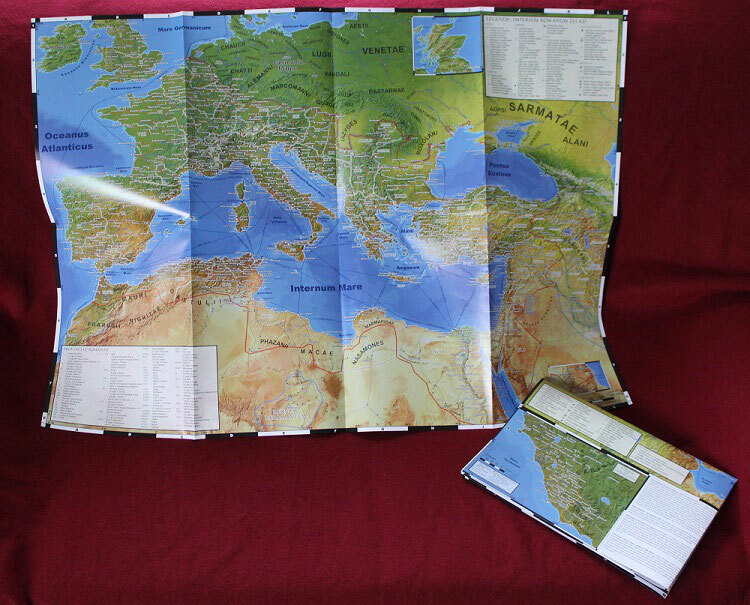 The result is the new double sided poster, The World of Ancient Rome. It’s smaller. Not everybody can devote the space to display an enormous DIN A0 sized map, while its size made it also unhandy to study without putting it on a wall. Thus I scaled down the main Imperium Romanum 211 AD map from 1:4.5 million to 1:6. million, meaning it now requires only half the space, DIN A1 (84 x 59 cm) instead of DIN A0 (119 x 84 cm). Of course the amount of the detail was not reduced as well and everything is still easily readable. The new posters still look impressive on every wall, but can now be studied comfortably on tables or even handheld. More content. I wanted the new prints to combine all my Roman era themed maps. Thus the new poster is double sided. 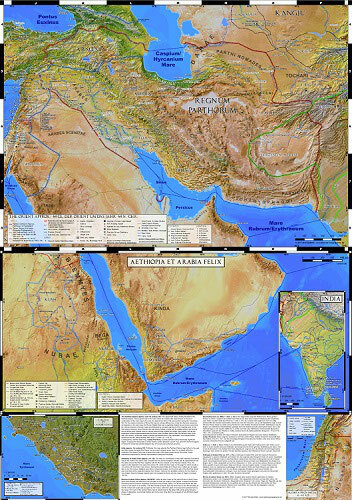 The front side features the Roman Empire map, while the backside includes my maps of the Parthian Empire and the states around the Red Sea south of Egypt in the same scale. Additionally, three ancillary maps show contemporary India, early 1st century Judea and the origins of the Roman state about 500 BC. 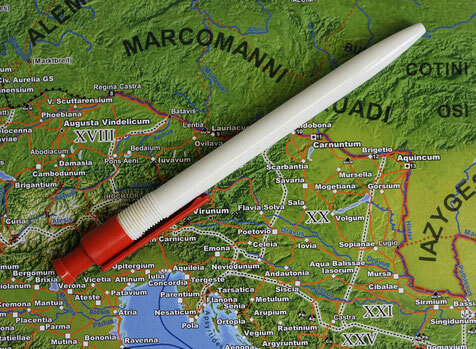 Just shrinking the map from DIN A0 to DIN A1 would have resulted in a new scale of about 1:6.4 million. By choosing a slightly larger 1:6 million scale and utilizing the posters back page a lot of content had to be rearranged, compared to the larger maps. An opportunity used to include more areas and combine the two Imperium Romanum 211 AD ancillary maps into one. Thus for example Roman era Scotland is now included in its entirety. The new prints are now available from my online store. Either rolled up or, with much lower shipping costs, folded to A4. 1 In accordance with Kleinunternehmerstatus exception of §19 of the German Value Added Tax Law, we do not collect or display VAT. Aufgrund des Kleinunternehmerstatus gem. § 19 UStG erheben wir keine Umsatzsteuer und weisen diese daher auch nicht aus.